Last weekend we visited the Kashmir road-end on the eastern side of the Ruahine Range, which I hadn’t visited since I went up to Longview Hut on a WTMC club trip near the end of 2006. Our group planned to go some distance further than Longview this time, and on to Howletts Hut which is quite a lot further into the range. Location: Ruahine Forest Park, Kashmir Road-end. People: John, Alistair, Sarah, Paul, Pete and me. Huts visited: Longview Hut (1 night), Howletts Hut (1 night). Intended Route: Camping at Kashmir on Friday night, up to Longview then down to a short river walk up to Daphne Hut (brrrr, cold), then up to Howletts for Saturday night. Return the same way. Actual Route: We actually walked to Longview for Friday night, then went direct to Howletts over the tops via Taumatataua and along Daphne Ridge for Saturday night. Returned the same way over the tops. The Kashmir road-end is more or less a dead-end and although DOC has been nice enough to provide a dunny at the end of the road, it isn’t surrounded by much in the way of good camping sites. There might be some possible camping just inside the start of the track, and it also looked possible to set up a tent fly or two under the pine trees a few hundred metres back along the road. Having driven up from Wellington on a Friday night, however, our plan had been to set up a camp at one of the private farms down the road, after gaining permission to do so. (Being in a club’s great when you have those kinds of contacts.) Turning up at 11pm, though, we were having second thoughts about camping at the road-end at all. There were a few possible routes we could take to get to Howletts, but by far the nicest would be to spend the entire trip on the tops if at all possible. The forecast suggested there might be some nor-easterly winds bringing in clag from the nearby east coast, and it seemed like a good idea to get up to Longview on Friday night so we could possibly have more options by Saturday morning. Most people in our group of six weren’t well prepared for Friday-night walking, and it took a small amount of un-packing and re-packing until we could leave. All this time we wondered what it meant that a school bus was also parked at the end of the road, but it didn’t deter us, and we were away by 11.15pm. The night’s walk by torchlight went well, and we reached Longview at around 1am on Saturday morning. The only small problem we had was near the top, where we almost lost the main route in the dark as it veered around to the west along the ridge just above Longview. John and I, who’d been there before, trusted our instinct too much and went looking further up the ridge for another pole marker. The other four, meanwhile, were doing something much more intelligent and consulting Paul’s GPS which reliably told us we were 300 metres from the hut. Walking on a bearing we quickly found the next pole on the route, and after that were quickly at the hut. The bunks were full as we ambled in, so by 1.15am we’d settled as quietly as possible on the floor and gone to sleep. I think everyone in our group was trying to prolong sleep as much as possible but as often happens, it really only takes one person to stand up and start talking quietly before others use it as an excuse to also rouse themselves. Consequently at 6.30am Longview Hut suddenly became lively place. The Sun was showing signs of rising over the frost outside, and we commenced picking up our things off the floor. The tramping group from Feilding High School was actually great to have around and they weren’t in the least stereotypical of what some people associate with school groups. They’d already been up until 12.30am, which explained how we’d seen faint lights as we walked up the hill, but they were also the only people in the hut at the time. In fact, it was more a group of students interested in tramping rather than a group of students being dragged out on a school trip, which is actually really cool. Besides, we’d walked in on them at 1am, and it seemed fair enough that they’d wake us up at 6am. 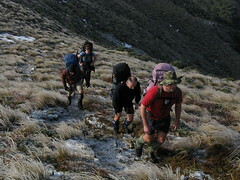 The school group was heading south on some kind of circuit that’d take them down to Awatere Hut. We were going in roughly the opposite direction towards Howletts, but hadn’t yet decided how to get there. The original plan had been to walk past point 1189 to the north-east, and then down the marked track to Daphne Hut before heading up to Howletts. The discouraging factor in this was the river walk, which although it wouldn’t normally be an issue, could be extremely cold at this time of year and not at all pleasant. Option 2 was to head north-west towards Otumore (1519) and then down to Daphne via point 1271, avoiding the river walk. Our preferred option was to avoid going down at all, and instead to walk to Daphne Ridge via Taumatataua (1415) and along to Howletts Hut along that ridge, staying on the tops for the entire time. The complication with the latter two routes was that we really didn’t know how much snow would be up on the tops. We had ice-axes with us which might help, but it wasn’t really possible to tell without seeing it. So after a casual breakfast, we said goodbye and set off over Pohangina Saddle just before 8am. In the space of about 30 minutes we’d climbed some distance towards Otumore (1519), and walking through tussock grasses encrusted in fragile icy enclosures. As we ascended towards Otumore it became more obvious that although there was snow along the ridge, it was intermittent and unlikely to cause problems. We reached a sign marking the ridge junction at 9am, and after a short break finished our climb to the highest point of the route. Otumore itself had the thickest slabs of snow on the route, with a 1 metre high snow pole just barely poking out the top in one location. We stopped near the top for a while, where the snow was fairly icy, and Alistair gave us some tips about how to edge boots in the snow. Pete, Sarah and I in particular spent some time practicing edging (without crampons), and also self-arresting with ice-axes. The other really cool thing about Otumore was that being a high point on the route, it gave us our first clear view of the interior part of the Ruahine Range. Te Hekenga (1695), which Alistair, Sarah and I had previously visited a couple of times on the way to Sawtooth Ridge, had its head in the clouds for most of the time, but was otherwise completely covered in snow, as was much of the interior part of the range. Regrouping just before the saddle. Shortly before 10am we were leaving Otumore, heading past point 1452 and towards the top of the fairly deep saddle leading over to Daphne Ridge, 2 km further north. Within 25 minutes, those of us at the front had reached the top of an alternative track which leads down to Daphne Hut from the top of this saddle, and once again it’s well sign-posted. 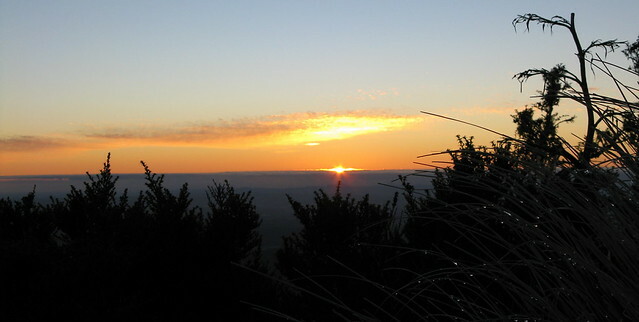 By now we’d definitely resolved to avoid dropping to Daphne Hut, since it was such a nice day for staying on the tops. We’d still be dropping into the saddle to reach Daphne Ridge, but before doing so we stopped at the sign-post to re-group since everyone had spread out some distance along the ridge. Sarah walking through the saddle. Daphne Ridge is also a really nice walk, generally being quite wide and easy to follow. Snow had settled in the shaded parts of the indented route along the top of the ridge, and we had to be a little cautious when treading on them, but the conditions never felt dangerous or terribly awkward. At 12.15pm, those of us at the front of the group reached the DOC sign-post which marked the track leading down to Daphne Hut from the north-west. A few minutes later we finally reached Howletts Hut, which was picturesquely embedded in the surrounding snow. Howletts wasn’t at all what I was expecting. I’d assumed it’d be a standard Forestry Service six-bunk box with a roof, which is completely wrong. On the contrary, it’s a very cute and well cared for hut. It’s currently attributed to the Heretaunga Tramping Club (HTC), and the fact that they spend a lot of time and effort to look after it is obvious. As well as the basic necessities, the hut was stocked with a couple of extra chairs, lots of firewood and coal for the stove, and a lot of reading material. It wasn’t just ordinary reading material, either. Members of the HTC have gone to great trouble to transcribe entries from the old hut books going back to the 1940s, leaving printed transcripts and photocopies of entries from the days when hunters would visit for the weekend and report shooting 30 deer, which is probably an order of magnitude higher than most hunters would dream of seeing today. I’m not sure if it’s a reminder of good times or bad times. The hut book itself was stored in a elegantly designed trophy-like case on the wall. It’s clear that the HTC really cares about preserving the history of the place, and making it as accessible as possible to those who pass through. Howletts Hut has “official” space for about 10 people, with 8 on one end and another 1-2 in the crow’s nest above the door. Platform bunks mean that it’s probably possible to squeeze an extra 2-3 people on the bunks if necessary, however, and there’s more space on the floor for when things get really desperate. Obviously it’d be crowded though, and the smallish size of the hut meant that it might have started to become less comfortable if there had been more than the six of us. Having arrived not long after mid-day, it was only after we arrived that we really considered having lunch. We’d had thoughts about walking up to Tiraha (1668) at the southern end of Sawtooth to the north of Howletts Hut, but decided we just couldn’t be bothered since it was still hiding in cloud and we wouldn’t have seen anything. Instead, I read the June 2008 FMC Bulletin which I’d brought along, and meanwhile I think everyone else just lazed away and caught up on the sleep we’d missed having only had 5 hours the night before. The afternoon evaporated as we relaxed, and over the hours the mist rolled in and the day grew colder towards the evening. We lit some candles and Alistair set to work to get the stove burning, seeding it with dead leatherwood kindling (which burns well) before piling on the coal. Within a few minutes Howletts Hut was becoming comfortably toasty. It was good motivation to get started on dinner, and before long we were chopping veggies, frying onion on the stove, and cooking pasta. Dinner was really nice in the end, even though I personally had trouble finishing my own serving. I grumpily dragged myself out of my sleeping bag just after 6am on Sunday morning when John came in and informed those of us with cameras that there might be a nice sunrise coming up. Pete followed me, and soon we were both freezing outside the door of the hut, clambering over the nearby frozen snow as we tried to get good vantage points for any interesting photos. Breakfast and packing up was once again leisurely, and we didn’t actually leave until 7.45am. For a brief moment in the morning we thought that the change of the wind to a nor-westerly might be about to cause a lot of clag to waft over the tops, killing the visibility and views. Consequently there was discussion about whether we’d be better heading back over the tops the way we came (which could be fantastic if the views held out), or heading down to Daphne which would involve bagging another hut that only John had previously been to (and even then as long as 30 years before). The tops won out, and it was worth it. Fears that we’d be completely clouded in were unfounded. 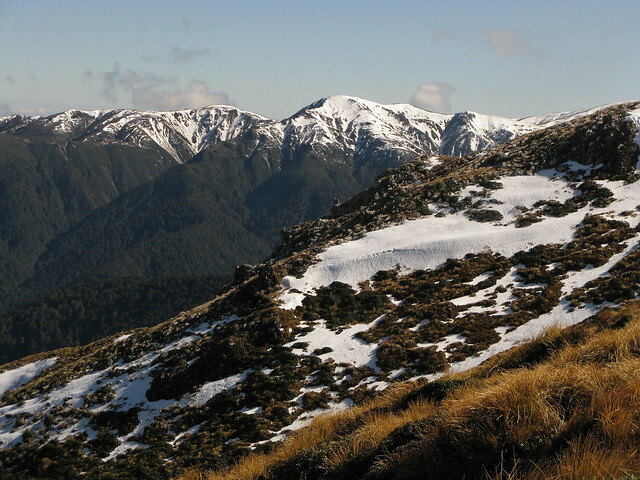 Walking south-west along Daphne Ridge was quite spectacular with the panoramic views of the snow-covered ridges towards the inside of the range. We were back at the top of the saddle just past Taumatataua (1415) at about 9.15am, and dropped into it as the cloud lightly wafted through the channel. 20 to 30 minutes later, we re-grouped on the other side at Department of Conservation Asset Number 078843, which might also be known as the sign that points down the east-ward spur from this point towards Daphne Hut. We stayed there relaxing and watching the scenery until about 10am, before getting up and continuing back to Otumore (1519), with its slab-cap of snow, which we reached 40 minutes later. There were several footprint signs of deer having trotted through the snow on the tops along this section, although on the far side of Otumore we found very obvious signs of other people having been sliding around in the area since we’d left it the day before. We later found out that this had been the other club group that was in the area — they’d stayed the night in Longview Hut and wandered up as far as here for an afternoon walk. Another five minutes and we were back at the sign marking the junction on the ridge that points to Irongate Hut further along the ridge, or back to Longview Hut via Pohangina Saddle. It was approaching late morning so we decided to aim for a lunch at Longview, except for John who was keen to make his way down to the carpark directly as he thought he might be walking more slowly. The rest of us arrived back at Longview an hour later, after a casual jaunt down the saddle, and settled into a nice lunch on a sunny day, after which we heated some kind of tasty hot chocolate mixture. Views on the way down to Longview. We left Longview for the last time at 12.30pm, on the way back to where the van was parked. On the way down, we passed the first people we’d met since leaving the school group on Saturday morning. A couple from Hawkes Bay who were on an afternoon walk said hello, and then suggested that with us being from Wellington it must have been unusual having such calm and sunny weather. Just over an hour later at 1.40pm or so we were back at the van, which was about half as long as it’d taken to walk up the hill in the dark. John had actually been waiting there for about 45 minutes. We packed up, hopped back in the van, and settled in for a nice drive home. Yay for ice-cream. 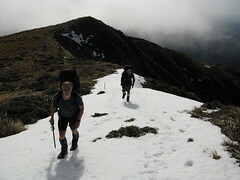 This entry was posted in tramping and tagged bagged:howletts hut, bagged:longview hut, ruahines, tramping. Bookmark the permalink. 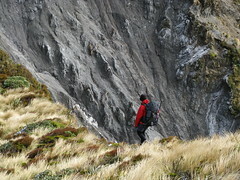 Hi Mike, enjoyed reading the post esp with the upcoming trip to the Ruahine’s. 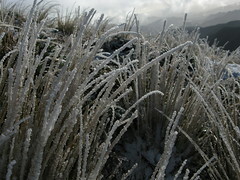 The wide tussock tops is a contrast to the Tararua’s where I walk which seems to be narrow goat tracks on the edge of the ridge. Hi Adrian. Yeah they have a different feel to them. Alistair (from this trip) has a belief which I’m tending to agree with that if you arrange things right in the Ruahines, you can scoot around on the tops all day and go a very long way (if that’s what you fancy) without being very inhibited at all. Last time we did this I was ashamed to admit I was getting bored of tops by the end of the day, and just wanted to walk under trees for a bit. Just keep in mind that the Ruahines can be difficult for snow in winter. They’re also slightly higher than the Tararuas and on certain days can be deceptively extremely windy as soon as you hit somewhere exposed. Yep, definitely one of my favourite huts. It has so much character. Very much enjoyed your Howlett’s Report. I was last there in about 1959 and have often wondered how Daphne Spur and the leatherwood are holding-up. My mate and I got trapped up there when the Tukituki was in flood and escaping out over the tops was not on. But Bravo the HTC for taking good care of this marvellous place. Video on a tramping trip? Yep, a whole new world! Hi Roger. You’re most welcome. If it’s of interest, we visited Howletts on one other occasion, which I wrote up here. 1959 must have been quite a different time to visit this area! If you wrote in the log book then I wouldn’t be surprised if the HTC now has an electronic copy. Yep, we would have written in the log book. But my mate Graham Snadden was more of a scribe than me. Back then, huts like Howletts had old canned-food perched on the framing. Watties this and Watties that!. It had been air-dropped in (and was left over) from various searches. However, most of the labels were gone! So, when we were stuck up there – and hungrily eyeing the food – it was like backing horses at the Hastings races. Snadden and I dug our first snow cave at Tiraha. He made me sleep there (in the cave) when the hut was just down there! The leatherwood on the slopes down into the Daphne Spur was very formidable in those days. Also, all your talk of signs is news to me. It was quite easy to get lost coming up Daphne Spur from the river. There were onloy a few mouldy orange discs put up by HTC members years earlier. Your picture of the hut today shows something quite different to the old days. I used to go on hut “working parties” but am not old enough to be in the generation that carried in heavy stuff on their backs during the years these huts were built. In the 1950s there were numerous newly-arrived (from Indonesia) Dutch immigrants in the HTC (like Jack Landman and Phil Baynes). Did they show laid-back kiwis the meaning of slogging and hard work!! Howletts is where I learned to make good decisions, look after myself and rely on my mate Snadden. No texting, no phones, no helicopters, no DOC. I am immensely grateful for everything I got from the HTC.